A warm welcome awaits you at Sunnycroft Farmhouse. Perfect for a family break to use as a base to explore and enjoy all that the Scottish Borders has to offer. Our family owned livestock farm is situated in the heart of the beautiful Scottish Borderlands. Come and visit, enjoy a wonderful diversity of sports and activities, wonder at the local historic buildings and events, and learn about heroes and villains, past and present. One of the most celebrated Scotsmen ever to have lived, a prolific historical novelist, playwright, poet and historian, Sir Walter Scott, built his beautiful home, Abbotsford, on the banks of the River Tweed, only 3 miles from Sunnycroft Farm. Two miles upriver you’ll find Lochcarron, world famous for tartan and textiles, offering mill tours, and a little distance further on you can enjoy horseriding, the adventure playground, fishing and walking in the beautiful estate of Bowhill, or just marvel at the magnificent house, owned by the Duke of Buccleuch. Nearby, Bisley at Braidwood, is Scotland’s largest shooting ground and caters for everyone from the beginner to the seasoned professional. 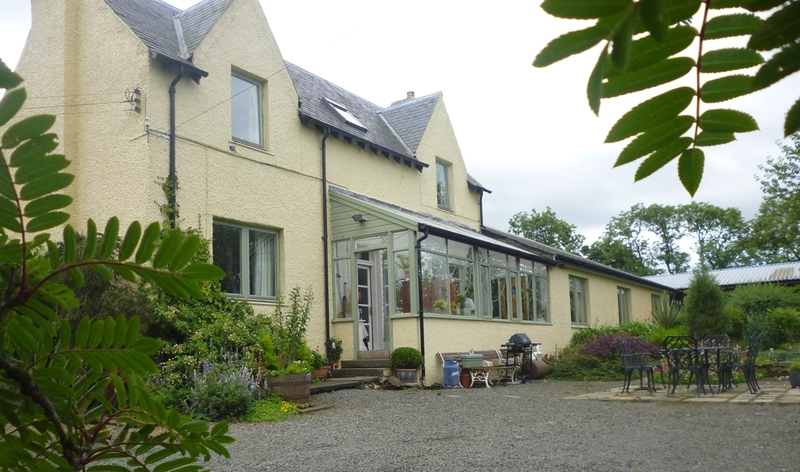 For horse enthusiasts there is the marvellous Ian Stark Equestrian Centre a few miles to the south from the nearby ancient market town of Selkirk. Within a 9 mile radius of Sunnycroft Farmhouse B&B are no less than four towns, each offering a different visitors experience and each passionate about its rugby and Common Riding culture. Local crafts, boutiques and tasty delicacies are a joy to find. Indulge in the best of regional cuisine in the multitude of restaurants, tearooms and pubs, everything from Selkirk Bannock to succulent, locally produced lamb, beef or haggis, tomatoes and soft fruit. Come and sample our craft gins and beers. With the new Borders Railway link with Edinburgh, access to the region has never been easier. Galashiels, then Tweedbank stations at the end of the line are only a few miles from us, so for a day trip, it’s easy to head up and straight into the very heart of Scotland’s capital city. The Ettrick and Yarrow river valleys to the west, have been inspirational to poets, novelists and artists for hundreds of years, and the stunning Berwickshire coastline to the east, offers visitors so much choice, they will want to stay longer. From the North, Edinburgh and Airport take the bypass South, and follow signs for A7. At the Kingsknowe Roundabout on the outskirts of Galashiels follow signs for Selkirk. Drive about 2 miles, there is a turn off for Abbotsford House to the left. Take the next left off the A7, sign for ‘Lindean’, where the road widens. Once over the crest of the hill you will see the farmhouse on the right. Make your way through Peebles, towards Galashiels. At the Kingsknowe Roundabout on the outskirts of Galashiels follow signs for Selkirk. Drive about 2 miles, there is a turn off for Abbotsford House to the left. Take the next left off the A7, sign for ‘Lindean’, where the road widens. Once over the crest of the hill you will see the farmhouse on the right. From Carlisle, take the A7 North to Hawick then continue on A7 through Selkirk. Once outside the 40mph speed restriction, heading towards Galashiels, drive only about a mile until you see a bus stop on the right, the road widens and the sign for ‘Lindean’ points to the right. Exit A7 here. Once over the crest of the hill you will see the farmhouse on the right. Take the A696 and follow signs for Jedburgh, continuing forward onto the A68. Turn off A68 at St Boswells, signed ‘Selkirk’ (A699). Drive for about 6 miles and look for ‘Lindean’ sign. Exit to your right and follow road past Lindean Loch and then down steep hill about another mile before you see Sunnycroft farm shed roofs on left.